There are certain vegetarian dishes I cook for friends that I could quite happily eat every day and frittata is one of them. It's yummy and healthy! And pretty easy to cook. This makes enough for at least 4 people, served with a side salad. Start with your vegetables. Chop the onions, courgette, red pepper, half a stem of broccoli and mushrooms into small ish cubes (bigger than 1cm). Fry the onion in a spoon of sunflower or vegetable oil in a medium size frying pan. Add the rest of the vegetables after a couple of minutes. 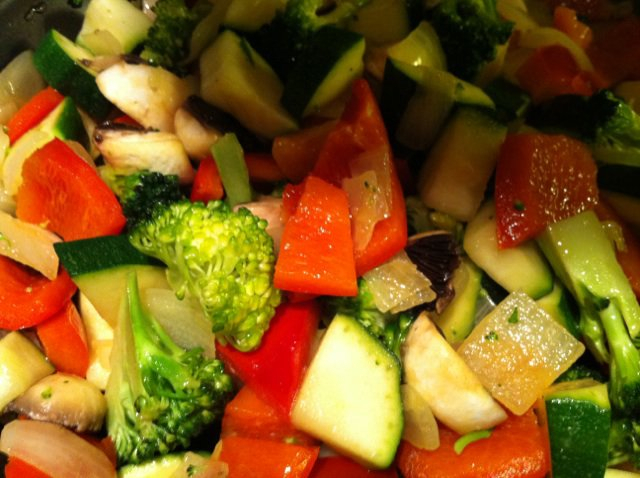 Fry the vegetables over a medium heat, for 5 minutes, or until they are starting to soften. Break the eggs into a bowl and beat lightly. Add salt and pepper and then tip into the vegetable mix, shaking the pan so the eggs get under and between all the veggies. Turn the heat down slightly and sprinkle some broken up goat's cheese on top of the egg and veggies. My favorite goat's cheese to use is the really soft crumbly one, normally called Welsh goat's cheese. Fry the frittata for 5 minutes and then put the frying pan in the oven. 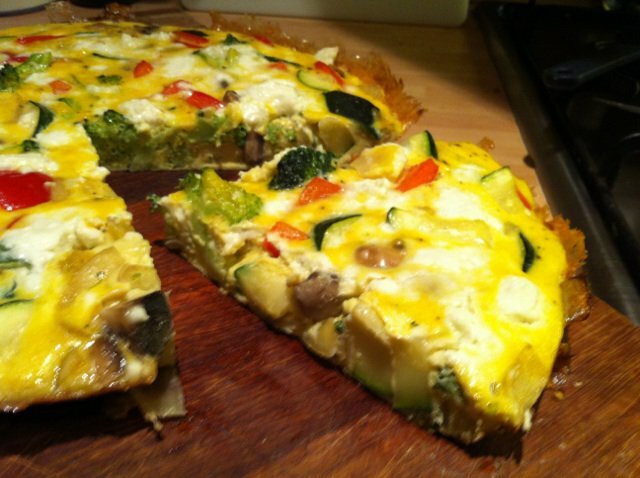 Cook for 10 minutes or until the top of the frittata is cooked. Be very careful when you get it out the oven as the handle of the pan will be hot! Serve warm with green salad or leave to cool and serve with a potato salad for a summery lunch.